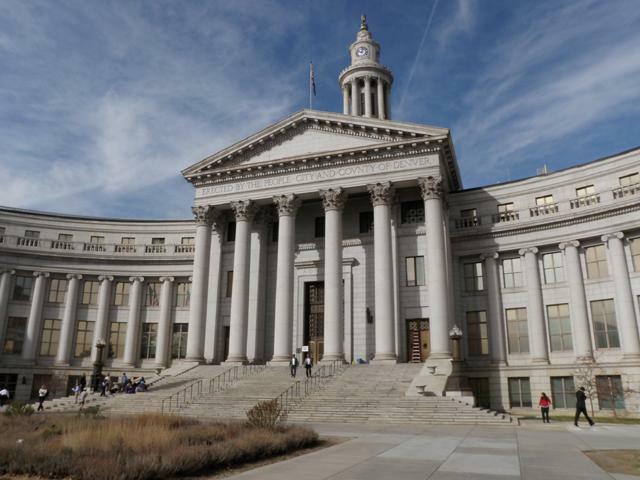 DENVER — As U.S. Immigration and Customs Enforcement officers become an increasing presence in courthouses, victims of domestic violence are shying away from testifying in cases, according to City of Denver officials. Denver City Attorney Kristin Bronson explained Friday that four cases will be dropped as victims fear ICE officers will arrest and deport them. As the victims, who are the crux of many cases, will not testify, prosecutors are left with no option but to drop the cases, leaving potential criminals on the streets. "We have four alleged perpetrators of domestic violence who are back out on the streets without any kind of punishment, and that concerns us greatly as we try to keep Denver a safe and welcoming community," Bronson said. Bronson said when executive orders were signed on Jan. 25, the ramping-up of targeted deportations became a city-wide concern. "They were undocumented and, as a result of recent developments, they were unwilling to continue with the cases. We will be having to dismiss the charges of the alleged perpetrators of that domestic violence," Bronson said. Courthouses in Colorado have become a place where ICE officials can wait for anybody accused or suspected of a crime and detain them for deportation. Attorneys have taken notice. ICE officials were present when Jeanette Vizguerra was scheduled to appear for a routine court proceeding, but only met her attorney. Vizguerra instead escaped to a Denver church. Her story became a national phenomenon, with lawmakers calling Vizguerra "the new face of immigration." The mother of three remains hidden in a Denver church, determined to become a taxpaying citizen, rather than a taxpaying undocumented immigrant. MORE | Read more on Vizguerra's story here . Vizguerra's attorney Hans Meyer instructed his attorneys to document the presence of ICE agents in plain clothes inside the Denver courthouse. "ICE is not even bothering to obtain warrants, unlike any other law enforcement jurisdiction, and is completely opaque about their operations with court personnel and the City of Denver," Meyer wrote. In a video, Meyer's attorney confronts three plainclothes ICE agents, who decline to answer questions. ICE confirmed to Denver7 their agents were present in the Denver courthouse, but said the agency has every right to be there. "ICE policy allows officers to enter public buildings, including courthouses, to conduct targeted arrests of individuals," Shawn Neudauer, ICE spokesman, said. Neudauer also said those agents had the proper forms to conduct an arrest. "The ERO officers in question were in possession of a signed administrative arrest warrant at the time of arrest," Neudauer wrote. "Form I-200 is the administrative arrest warrant signed by an authorized ICE official that documents an individual arrest." Defense attorneys and prosecutors alike are taking issue with the way some of these arrests are taking place. "ICE's actions destroy the trust that Denver law enforcement agencies have worked so hard to build with immigrant and refugee community members," Meyer said. "When people do not feel safe resolving cases or appearing in court, when people are afraid to call the police to report crimes for fear of having to come to court as witnesses, and when people no longer feel safe appearing for their rehabilitative probation meetings, that makes everyone in Denver less safe." In the case of Vizguerra, Meyer said he instructed the mother — who has been living in the U.S. for 20 years — to not attend her court hearing, which could have extended her stay in the U.S. while her application for permanent residency is mulled over. Police officials have taken stances that line up with Meyer's words. "To our immigrant community, call 911 if (you) need emergency assistance!" Aurora Police Chief Nick Metz wrote on Feb. 17. "APD won't investigate, enforce or detain solely for immigration status." Bronson, who works hand-in-hand with police to put criminals behind bars, also agreed. "We need to maintain the distinction between the federal role and the local role and if we do not do that and that line becomes blurred, victims are no longer willing to come forward, witnesses are no longer willing to come forward, and that's trust that's so important to the law enforcement relationship erodes," Bronson said. In one week in February alone, ICE officials rounded up nearly 700 people across the nation according to U.S. Homeland Security Secretary John Kelly . The retired general described the operations as targeted.